Jobcentre staff are being ordered not to count how many desperate people they are sending to foodbanks, it emerged today. Ministers were branded "shameful" as the shocking policy was disclosed in "operational instructions" sent to thousands of staff across the country. Critics say the data black hole lets top Tories conveniently avoid having to say how many people benefit cuts have pushed into poverty. The Trussell Trust charity handed out 1.3million food parcels last year - up from 61,000 in 2010/11 - with "benefit delays" the second-most common reason for turning to help. Yet just weeks ago, ministers said they'd made "no estimate" of the use of foodbanks by people hit in a £2billion tax credits cut. And Theresa May has insisted there are "many complex reasons" for people begging for handouts. The guidance was released by the Department for Work and Pensions (DWP) under the Freedom of Information Act. It deals with the policy for when staff hand out a "signposting slip" to benefit claimants, which effectively refers them to a food bank. There is a record sheet on which staff can write down the details of slips they have handed out. 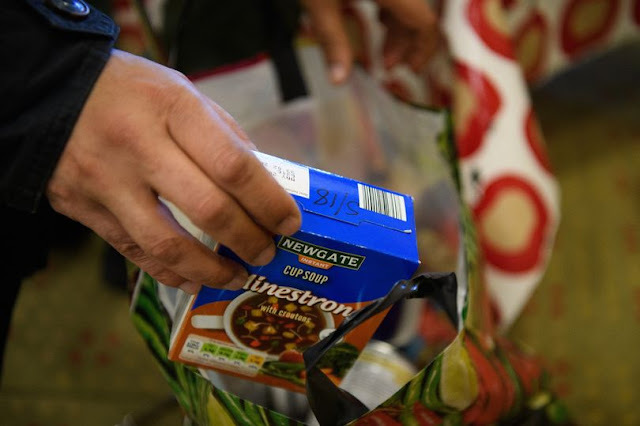 But guidance says the record sheet "should only be completed" if local foodbanks have specifically asked for it. Even then, the record should only be used to "authenticate" slips, staff are told - and "it is not to be used for any other purpose, including to count/monitor the number of signposting slips issued". Staff are not even allowed to call the slips "vouchers", even though one foodbank manager told HuffPost UK - which first reported on the disclosure - that they are essentially the same thing. Labour MP Frank Field, who leads the Commons Work and Pensions Committee, said: “Does the DWP not want to know how many times Jobcentre staff are having to refer people to foodbanks? Last month Labour peer Lord Bassam asked for an estimate of how many children had been pushed into poverty by the two-child limit on Child Tax Credits. The policy, which kicked in last year, is expected to cut almost £2billion a year from the benefits bill by 2022. But DWP minister Lord Bates told him: "No estimate has been made of the use of food banks by families affected by the policy." Lord Bassam told the Mirror: "It is truly shameful that Ministers haven’t thought to assess this impact of their £2bn cut. It comes after Tory ministers secretly launched a study to find out if their own cruel austerity policies are causing the surge in food banks. The £217,000 research will seek to answer a question thousands of campaigners say they could have answered for free. Tory welfare chief Esther McVey has previously tried to blame the explosion in numbers on Labour, who she said "refused" to let Jobcentres signpost people to food banks before 2010. But a leaked research plan shows the Department for Work and Pensions (DWP) will look at whether its own policies are to blame.